You want to look younger, but you want to look natural, too. And you’re not alone -- facelifts account for about 20% of all surgical cosmetic procedures performed each year. Thanks to major advances in surgical techniques and our understanding of the aging process, modern facelifts produce results that are nothing like the old “caught in a wind tunnel” procedures. In fact, today we have multiple types of facelifts, so you can achieve the natural look you want without overdoing it. This fits beautifully with Dr. Jeffrey Raval’s philosophy: Less is More. 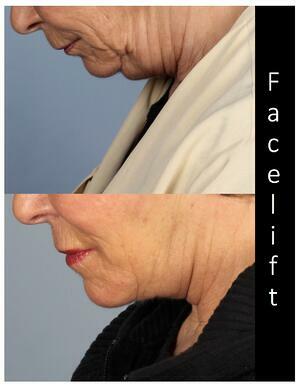 “Facelift” is no longer a one-size-fits-all procedure. Instead we have a variety of techniques we can use to perform facial rejuvenation surgery that is tailored to meet your specific goal to look really great for your age. It’s even possible that considering a facelift is premature. If you’re young and your skin is still supple, non- or minimally-invasive options such as dermal fillers or Botox may provide the results you desire. However, fillers and injectables don’t adequately address certain concerns, nor are they appropriate for a patient with multiple needs. And in many cases, they simply aren’t enough to turn back the clock in the way that you want. Not surprisingly, most people think a facelift surgically alters the entire face. This is not true. Rhytidectomy, as it is formally known, is a procedure that addresses the lower third of your face -- from the mouth to mid-neck – by lifting and removing excess skin. It is meant to reverse the sagging caused by gravity as we age and smooth the wrinkles and folds caused by time and exposure to the sun. Just as every face is different, individual plastic surgeons approach facelifts differently. Here at Raval Facial Aesthetics and ENT, we perform three basic types of facelifts. As the name implies, the mini-lift is a more subtle procedure. The surgeon makes a small incision near the ears, then removes excess skin and re-suspends the remaining skin and underlying tissue. This surgery is shorter, and there is less recovery time, compared to a more extensive facelift. The mini-lift is a good choice for those in their 40s (or even late 30s) to early 50s, who have begun to develop jowls and want to give their jawline a boost. The mini-lift does not address the neck. It is a way to “reinvent” yourself just enough to look younger but still entirely natural. As such, it can help keep you looking younger longer, putting off any future need for a more extensive facelift. Patients in their mid-50s or older – those with more advanced signs of facial aging – need more than a mini-lift to achieve optimal results. You may have read or heard about the MACS (Minimal Access Cranial Suspension) facelift technique, or perhaps the SMAS (Superficial Muscle Aponeurotic System) technique, both of which address the entire lower third of the face. These are similar in concept to a mini-lift, but considerably more complex since they involve elevating deeper tissues as well as removing excess skin. The SMAS procedure is somewhat more extensive than MACS because it involves deeper layers of tissue. However, while Dr. Raval is skilled in both of these techniques, he now prefers to perform the newest, most advanced technique, called the deep plane facelift. The reason? More effective results! A deep plane facelift goes below the SMAS layer to release and then re-suspend deeper muscles. That makes it an excellent choice for patients who want to improve mid face issues other facelift techniques do not include, such as nasolabial folds or “hollows” under the eyes as well as moderate to severe jowls at the jawline or moderate to severe banding or fullness in the neck area. Dr. Raval prefers the deep plane technique because it produces the most robust, longest-lasting results. In fact, he often incorporates this technique when performing a mini-lift, to further enhance results of this “lighter” procedure. Nonetheless, if you have only minimal skin laxity, he may still recommend the SMAS option as the best procedure for you. For a deep plane facelift, Dr. Raval makes incisions along the sides of the face at the hairline. This procedure takes longer than a mini-lift, of course. Recovery time is also longer, and the cost higher. Some people experience more pronounced aging on their neck than along their jawline – sagging, wrinkled skin and/or accumulations of fat. Men often complain they can’t wear a tie anymore, because their neck sags over the edge of their collar. 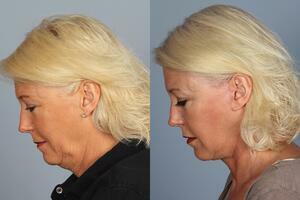 A necklift is ideal because it is specifically targeted. It rejuvenates by lifting sagging neck skin, removing fat, and tightening the underlying muscle. You may have heard about Kybella, an injection that is sometimes confused with a necklift. Kybella only removes accumulated fat that causes a double chin, it does not address sagging skin as a necklift does. Which is the best choice for you? Schedule a consultation with Dr. Raval to discuss your specific situation. What about the Rest of Your Face? There are other surgical procedures specifically designed to improve the appearance of the eyelids (called a blepharoplasty) or the forehead (often called a brow lift). In many cases, these may also be combined with a facelift. It’s not unusual for patients – usually older individuals with more severe signs of aging -- to want full facial rejuvenation. But that requires more downtime, and increased time under anesthesia can increase risks. So people who want a full facelift often choose to divide their surgery into stages. 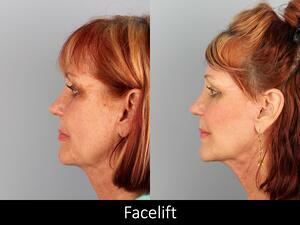 What Does the Facelift Surgery Process Involve? Because every patient is different, every facelift is unique. Dr. Raval may recommend a combination of techniques, or even a traditional full facelift, depending on your personal situation and goals. Because aging causes us to lose fat as well as skin elasticity, Dr. Raval may also use dermal fillers to re-plump contours or wrinkles, creating an even more natural looking “finishing touch” for your procedure. In some cases, he may also recommend a skin resurfacing treatment, but you’ll want to wait on that till you’ve fully recovered from your surgery. You will go to sleep and wake up to a new you. Still yourself, of course, but once you’ve recovered you will look younger, better rested, and more vibrant. For an SMAS or deep plane facelift, Dr. Raval will make incisions that begin at the temples and continue around the ear to the lower scalp. He will detach deep muscles and connective tissues, lift and re-suspend them to tighten the underlying foundation of the lower face. This is far more effective at achieving a younger look than the old style facelift that over-tightened skin. Dr. Raval will then remove any excess skin. He may also make a small incision under the chin, if needed to remove fat under the chin or along the jawline. Mini-lift incisions are shorter. The surgical steps are similar to those of a deep plane lift, but less extensive. Nonetheless, Dr. Raval may use the deep plane technique to ensure best results. A mini-lift does not involve the neck. For a necklift, Dr. Raval will make incisions that start in front of the ear lobe and then wrap around the ear into the hairline behind the ear. (In some cases, if only a limited neck lift is needed, he may make incisions only around the ear.) He will then remove accumulated fat from the neck and jowls and trim away excess skin. He may also tighten the underlying platysma muscle. Dr. Raval may choose to use sutures that will dissolve on their own. If not, you will need to have your sutures removed a few days after surgery. Because is a skilled surgeon, he is able to place incisions for all types of facelifts within the hairline or natural creases around the ear. Once healed, it’s unlikely anyone will be able to notice any scars. Following surgery, you will rest in the recovery room for about an hour while the anesthesia wears off. Then you can go home – but someone will have to drive you. You will receive detailed, written follow-up instructions on what to do at home to care for your incision sites ad help speed your recovery overall. Exactly how long that will take depends on the details of your surgery and your overall health. It also depends on you doing your part – it is essential to follow Dr. Raval’s instructions in every way. If you do not, you run the risk of delaying your recovery or even inviting problems such as infection. No one wants that! If you were a smoker before your surgery, it is especially important that you continue to not smoke as you recover. Smoking can seriously hamper healing by restricting blood flow to the surgical sites. At first, you will have one or two tiny tubes at your incisions, to help drain any excess blood or fluid. These are usually removed the next day. You will wear a special wrap around your face and neck for a few days to help minimize swelling and bruising. You may also be given medication to help relieve initial pain or discomfort. After about a week, your stitches can be removed. You should be back to moderate exercise in a couple of weeks, and swelling should be mostly gone in about 3 weeks. If you’ve had a deep plane facelift, it may take a little longer for all your swelling to go down, but in most cases facelift patients are ready to go back to work, etc. in about 2- weeks. One word of caution: you should avoid wearing turtleneck shirts or sweaters or any other pullover clothing until your recovery is well along. Ask Dr. Raval about how this pertains to your specific surgery. It is important to note that it may take 2 or 3 months for your face to feel entirely back to normal in terms of skin sensation and tightness. Nonetheless, you’ll start to see visible improvement soon after your surgery, and that will continue to develop during your recovery period. These figures include surgeon fees, facility fees, and anesthesia. Though approximate, they give a general idea of cost to help you compare options. Pricing is one of the things you will want to discuss during your personal consultation. Most health insurance does not cover cosmetic surgery. However, we recommend that you speak with your provider before scheduling surgery, to be sure you understand what your policy does or does not cover. *Price Ranges apply based on the varying facility fees associated with the three hospitals we partner with. Prices as of March 2019 and subject to change with time. No matter what type of facelift you choose, we know your primary goal is to look more youthful but still entirely natural. You may fine you also feel a renewed sense of self-confidence. The changes made during facelift surgery are permanent. On average, patients look 7 to 10 years younger, depending on which facelift procedure you choose. 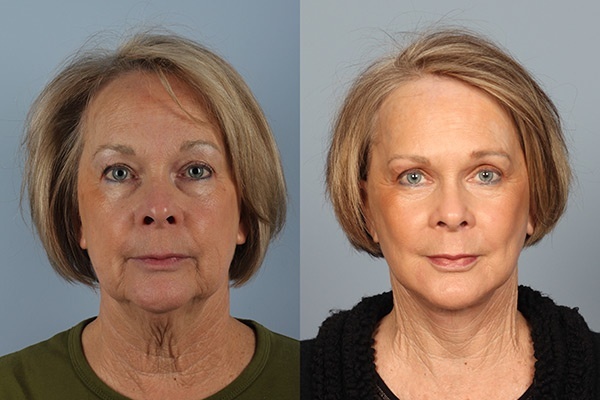 The deep plane facelift can help you look 10 to 15 years younger. It is important to remember that your face will continue to age over time. Nonetheless, you will still continue to look that much younger. The most important factor in achieving a successful outcome is realistic expectations. Since we have many facelift and necklift options now to customize procedures for every individual, it is easier than ever to look great for your age without making overdone or obvious changes. You can simply look smoother, healthier and more vibrant. The best way to maintain your refreshed look is by using sunscreen always – always – when you venture outdoors. Surgery and other treatments can improve the appearance of your face, neck, and skin, but without sunscreen the sun’s UV rays will create new damage. Will I Have Scarring from a Facelift? Every surgical patient wants to know if they will have visible scars. That’s especially true when it comes to facial surgery, since our face and neck are not areas we can easily conceal with clothing. By choosing a skilled surgeon who uses the latest techniques, not only can you expect entirely natural looking results from a modern facelift, you’ll be happy to know that any scarring will be minimal, or maybe entirely invisible. By their very nature, incisions do leave scars. As they heal, and over time, they become less and less visible. For every type of procedure – deep plane facelift, mini-lift, or necklift -- Dr. Raval makes the smallest incisions possible to achieve your desired results. He places them within the hairline or in other locations such as creases around the ear, where the scars will be virtually undetectable. And he closes and sutures the incisions with great care. No one will know you’ve had “a little work done” unless you tell them. Every person has somewhat different facial structure and skin, so surgical results can vary from one patient to another. In addition, every patient has their own ideas about what specific signs of facial aging they want to address and how extensive they want changes to be. This is why Dr. Raval individually tailors each surgical procedure for each patient. Nonetheless, you can get a good idea what a facelift or necklift might do for you by reviewing the before after photos of various facelift patients. Look for pictures of patients who are about your own age, with the same concerns you want to address, so you can get the best idea of what you might realistically expect for yourself. Look for patients of your same gender, too, because both concerns and results can differ to some degree for men and women. 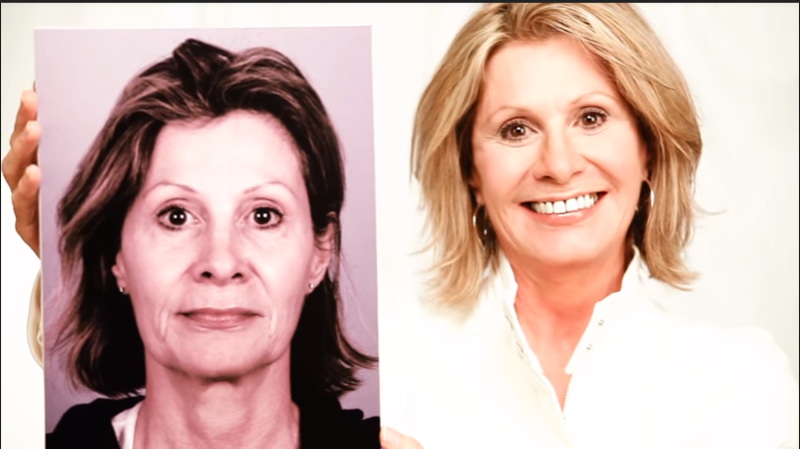 Just as important, you want to look at a wide variety of before and after examples that show facelift patients of the surgeon you are considering. That will give you the best overall idea of their skill and success in producing natural-looking results. As you examine each photo to compare results to the “before” picture, look to see if you can detect any scars. One easy way to learn more about Dr. Raval’s work is to view the facelift before and after photo gallery on our website. Any healthy, active adult who wants a more youthful-looking face and/or neck is a good candidate for some type of facelift. Are you in your 20s or early 30s? Dr. Raval may recommend a non-surgical option if you’re looking for just a little enhancement. These options are fast, affordable, and require little or no downtime. Are you in your 30s or early 40s? Dr. Raval may recommend a mini-lift. Are you in your 50s, 60s, or 70s? Dr. Raval will probably recommend an SMAS or deep plane facelift and/or a necklift. As with any surgery, you should also be a non-smoker. If you do smoke, you will have to quit one month prior to your facelift surgery and continue to avoid smoking for one month after. Smoking constricts blood flow, which can delay healing. Guys want to look their best, too. Looking young and vibrant can help you retain your competitive edge on the job, whether you’re in a leadership position at your current company, hoping for a raise, or on the hunt for a new position. Looking youthful above the neck complements all the hard work you do to maintain a strong, healthy physique. And, let’s face it. Looking good makes you feel good when you look in the mirror. Increasingly, then, men are asking themselves why women should be the only ones to benefit from the latest facial rejuvenation options. 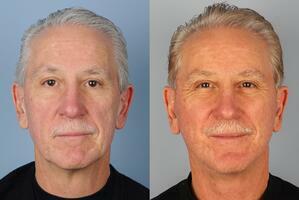 As a result, about 10% of facelift patients are now men, a number that continues to increase. That said, facelifts for men are not necessarily exactly the same as for women because men are, well, different. Typically, a man’s skin is thicker than a woman’s and male facial musculature is a bit different, which may affect how Dr. Raval approaches your surgery. Furthermore, many men wear their hair quite short, making the question of potential scarring even more important. Most definitely, if you’re a guy, you will want to choose a facial surgeon who understands how your situation is different. But your surgeon must also have the skill and experience to produce results that are more youthful but still masculine looking, and undetectable, too. 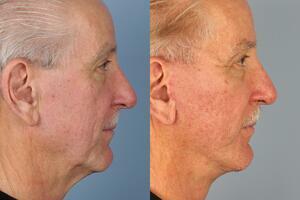 And speaking of results, men and women often differ in what they hope to achieve with a facelift. We live in a culture in which women look “old” if they have facial wrinkles or folds and/or sagging skin and hollow cheeks. Even early signs of aging are cause for concern. Men, however, tend to look more masculine as they age. Their faces don’t develop wrinkles, they take on greater character. So, when it comes to a potential facelift, men are often less concerned about might to moderate nasolabial folds or loss of rounded contours in their cheeks as women would be. On the other hand, we tend to view men who exhibit signs of aging along their jawline and on the neck as “older” looking. As neck skin becomes lax, it can also cause annoying difficulty buttoning a shirt, and the excess skin can bulge over the collar – issues women don’t have to contend with. As a result, men are often particularly good candidates for necklift surgery, rather than some other type that addresses the mid-face. And, with all that, there are still plenty of men who do want – and could benefit greatly from – a full facelift or mini-lift, not to mention an eyelid and/or brow lift procedure. Man or woman, we are all different. Many men say their biggest concern is that they want to look healthier and more virile, but not – heaven forbid – more feminine. This desire fits perfectly with Dr. Raval’s philosophy – less is more. He believes that the key to achieving the most natural looking results for every patient is to do just enough, but not too much, using techniques that will also produce the longest-lasting results possible. We’ve mentioned that there are times when Dr. Raval may recommend a treatment other than surgery, especially to address early signs of aging. 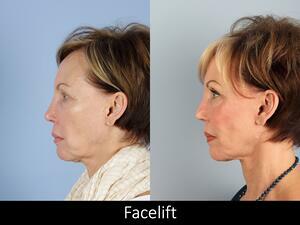 These options are not really “facelifts,” of course, but they can produce impressive results. Dr. Raval sometimes incorporates these techniques into surgical procedures, too, to provide a finishing touch that gives the most natural looking results. This is a clever name for the use of dermal fillers to erase finer lines and wrinkles or emerging folds, or to replace volume lost over time that starts to cause visible hollows or sagging. Fillers have become vastly popular, because treatments are quick, cause little or no discomfort, and require no downtime. Whether you’re in your 30s or your 50s, a liquid facelift might be the ideal option. Dr. Raval may also recommend Botox injections as a companion treatment, to help prevent development of future wrinkles. Remember that dermal fillers and Botox are both temporary solutions, because the material is eventually absorbed by the body. With refresher treatments, though, you can maintain your smoother look as you age. Don’t let the name put you off, there are no vampires or bats involved here, just a sample of your own blood. We also call this procedure the PRP facelift, because it is uses platelet-rich plasma (PRP) or its derivative platelet-rich fibrin matrix (PRFM) as the main ingredient. This is a simple two-step process, another office procedure that takes little time and requires little or no downtime. 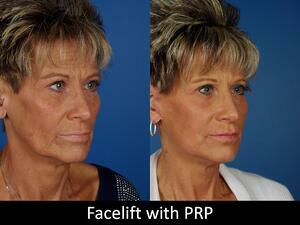 By combining the PRP (or PRFM) with a dermal filler and injecting it. The “Vampire Facelift” is an alternative treatment for fine lines or sunken areas, but it can help improve overall skin tone and appearance as well. You may have read about a new method of replacing lost facial volume, called the “stem cell facelift.” This procedure calls for harvesting fat cells from the buttocks, thighs, or tummy and then processing them to isolate their stem cells. The concentrated stem cells (which are natural growth triggers) are then injected into the target area. However, scientists are not yet convinced of the efficacy of this procedure, so Dr. Raval does not use it. It holds promise, he says, but further research is needed. If proven effective, stem cell injections may turn out to be a good companion to the deep plane facelift. Bleeding, which could lead to a hematoma or blood clot. Dr. Raval uses the post-surgery drain to minimize this risk. Temporary numbness or nerve damage, in which case it could take up to 6 months for feeling to return. No facelift can achieve “perfection.” The key to avoiding a disappointing result is ensuring you have an understanding of what a facelift procedure can do for you as well as knowing its limitations. This is an important part of the discussion during your personal consultation with Dr. Raval. Because your personal health and safety matter as much as surgical results, Dr. Raval always performs surgeries in accredited, state licensed surgical centers staffed with the most highly trained personnel. Having an excellent surgical team where the anesthesia is supervised by a physician anesthesiologist ensures that all patients receive superlative care that is worth the price. Regardless which procedure(s) you choose, surgical skill plays a vital role in the aesthetic and medical quality of your facelift. You want a surgeon who has the training, experience and aesthetic talent to help you achieve your goals. It’s your face. Above all, choose a surgeon you trust and who makes you feel comfortable. Your face is your first impression and a reflection of your self-image. If the face or neck you see in the mirror looks older than the way you feel inside, a facelift may be just the thing. But which type? 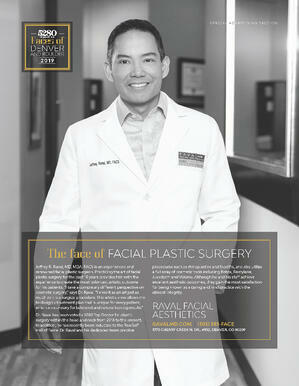 The only way to know is to schedule a face-to-face consultation with Dr. Jeff Raval. That gives you a chance to meet him in person and ask all your questions, and it gives him a chance to examine your face close up and discuss your aesthetic goals. Then you can work together to develop a plan that’s just right for you.